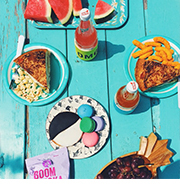 If you offer someone lemonade on a toasty day, they’ll probably hug you. If you offer them lemonade with strawberry infused vodka in it, they might just kiss you on the face. Be ready for it. I made this for my family when they were in town. We chugged it. We guzzled it. I should’ve made more of it. I needed it again in my life! You can even go crazy with this recipe and use some fresh-squeezed lime juice. 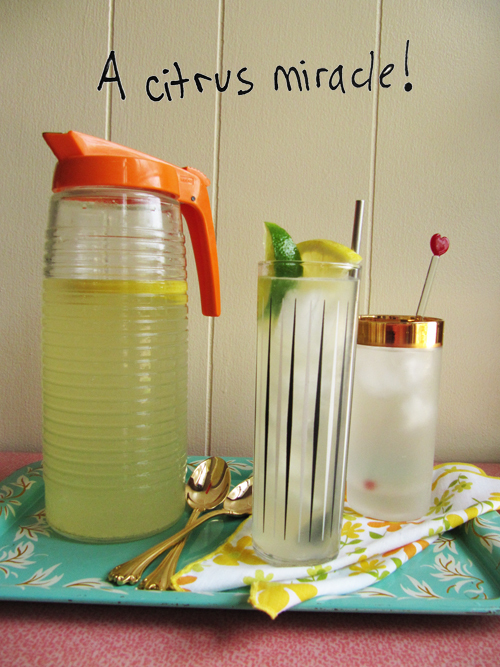 Make this lemonade and then chug it while standing in front of a fan, while feeling like a breezy supermodel. Do it. Make a simple syrup by dissolving the cup of sugar in a cup of boiling water. Stir until the sugar is completely dissolved. Set aside to cool to room temperature. Chill in the fridge until time to make the lemonade. Pour the simple syrup in a pitcher. Pour the fresh-squeezed lemon juice through a fine-mesh strainer (unless you like it pulpy) and into the pitcher. Pour 3 cups of cold water over the base to dilute. Chill in the fridge for an hour. 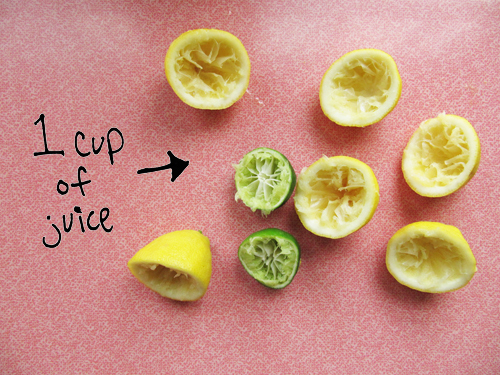 Sample your lemonade in a teeny cup and if it’s too sweet for you add more lemon juice, if it’s too tart add a bit more water. (I found that 3 cups of water was perfect!) Serve over ice with a lemon wedge. Enjoy! Don’t forget to make this before summer’s over! Don’t forget to make extra for me! 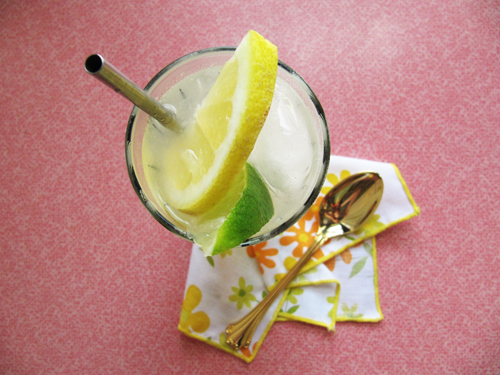 lemonade is just what you need in the summertime. fresh squeezed lemonade is even better. 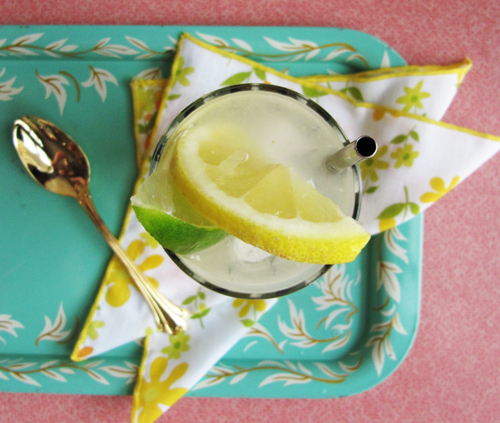 i just love that tray w/ the lemonade, it’s like a sun-shiney sky! Oh man, this was ridiculously good. Pretty sure I’m going to go buy lemons so I can make this. ASAP. Thanks Cindy! YOU’re like a sun-shiney sky! Laura – ooh gurl, you totally should. 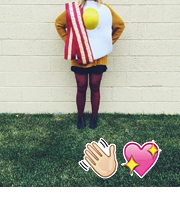 You’re a simple-syrup superstar. This lemonade was super refreshing and delish!! I would RATHER be drinking that right now then my iced tea!! Come over! Have some! Then let’s paint our nails. Cindy gave me crackle polish! thanks for the inspiration! we made this tonight substituting limes, cause that’s what we had. with some raspberry vodka, it was the perfect summer night cocktail. Ooh, lime and raspberry sounds amazing! I’m glad you made this as a lime remix. Yum! 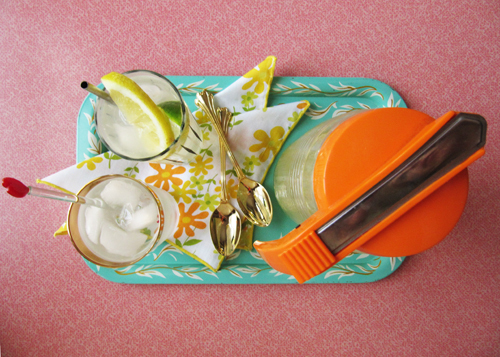 The lemonade looks delish but I’m really swooning over your serving set-up! So much vintag-y goodness in one serving! Thanks, Lisa! I’m a total sucker for vintage kitchenwares. I can’t stop collecting it!